hyperpycnal flow is produced when the density of the river water entering the basin is greater than the density of the standing water in the ocean basin. This higher density river water will flow below the standing water in the basin because of the difference in density. 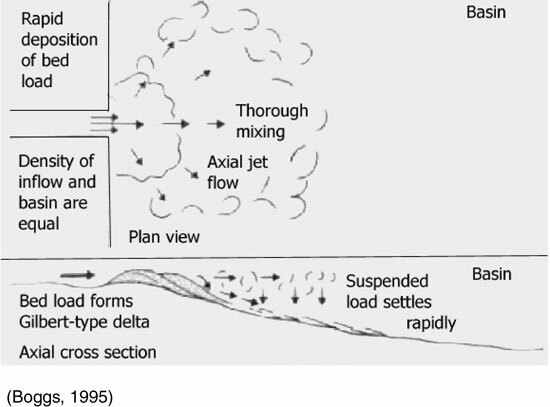 A zone of mixing occurs along the outer edge of the flow (as shown in the figure above). As the river water flows beneath the standing water, it erodes the previously deposited bottom sediments. Further out in the basin, the flow eventually deposits the eroded sediments as turbidites.